On the territory of Ukraine all servers * .yandex. * Were blocked. Because of this, the server http://mirror.yandex.ru/mirrors/cinnarch/$repo/$arch is also not available. As a consequence /var/lib/pacman/sync/antergos.db: has Unrecognized archive format. Because the provider returns an HTML page with a message about blocking access to the resource. Is there an alternative to this server on the territory of Ukraine? How can I deny access to this server, or switch to an alternative? I can see a Czech Republic Server and Bulgaria, you can try the Czech one may work good i do not think the Bulgarian will do a good rate. If it is true that when server is not reachable or giving a error page on request, this needs to be handled by pacmanitself( i have no clue about this…) but seems that you have some internet issue at the moment maybe? 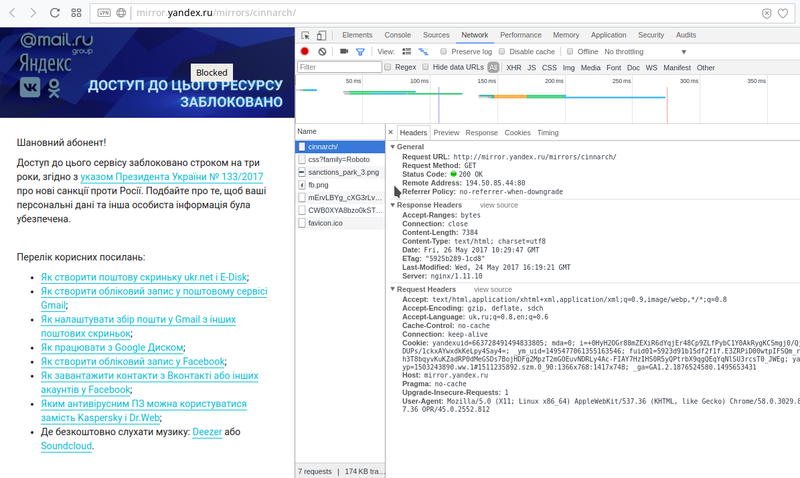 can you open http://mirror.yandex.ru/mirrors/cinnarch/ inside browser? Yes. The reason is in the ISP. As I wrote earlier, access to *.yandex.ru is blocked in Ukraine. My Internet provider returns an HTML page with information about the lock. or use proxy service onions e.t.c. This is my problem: I can not disable the Russian server. I completely removed it from the antergos-mirrorlist. And replaced the German server. As you can see, why does it still try to download the file from the Yandex server. I can not understand why.